Being right on the edges of Canterbury and Otago means we have a large geographic area to cover. Prior to the festival, if you have some spare time and would like to help spread the word of the festival by distributing posters, helping out online or communicating with local media, get in touch and we can see how you can help. We are a small festival run entirely by volunteers, so please help out whenever you see a need, whether it’s moving chairs in the main hall, getting wood for the fire, or finding a crying child’s parent. If you would like a more direct involvement, in helping with the running of the festival, every year we have a number of roles to fill. Please do not hesitate to contact our friendly Festival Director, Miguel Nitis directly, or to fill in our contact form in the navigation bar. 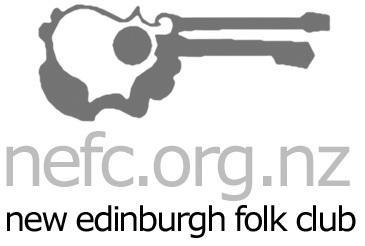 The New Edinburgh Folk Club derives its name from that of our fair city, Dunedin (the Scots Gaelic name for Edinburgh), founded in 1848 by Scottish immigrants. The club commenced in 1975 as a place where people interested in traditional and contemporary acoustic music could share their talents, skills and repertoire in a semi-formal and social forum. Today it remains a highly active club with weekly clubnights, three annual festivals and regular concerts, workshops, sessions and social activities. Although it is a `club´ in the sense that is an incorporated society, all our events are open to all- comers, audience and performers alike. A typical clubnight is a semi-formal concert. The first half is usually made up of floor-spots (casual performers who turn up - make yourself known to the compere) with the second half a booked performer advertised here and in The Clarion our monthly newsletter. Save The World, One Beer At A Time!! Trade Suppliers of Quality Specialised Printing for over 25 years, with great products and ideas to help promote your business, club or group. With so many products in easy-find sections, you are sure to find what you're looking for. The Advertising Clubb is your one-stop shop for a uniquely wide range of competitively priced and specialised advertising products and services.